It’s been 19.7 years since the last GPS week rollover took place in the year 1999. If you are still using an old GPS receiver for data collection, then after April 6, 2019 the GPS data will be recorded with a much earlier date. Newer GPS/GNSS use 13 bits instead of 10 bits to encode the GPS week number, and therefore will continue to work properly for a much longer time before the GPS week will be rolled back again. The position data will not be affected. If you are still using the MC-GPS, MARCH-II-E, ALTO-G12, L4 or Z33 data collection systems the data collection dates may be marked with a much earlier date. This creates a problem when you attempt to use PC-GPS to differentially correct the job data. There is no firmware update available for the old GPS receivers in these systems, but we have a fix for it. The udate.exe program is a DOS program that you can run in 32-bit Windows command mode. It will let you change date in an .ftr file. You will need to know the date your data was collected. After running udate, make a copy of the files associated with the .ftr job file (*.def and *.raw) then change the job name to be the same as the above <new job file name>. Then perform differential correction on the files with new job file name. Users of other makes of older GPS receivers, who make use of the date the data is collected, will need to be aware that the date is wrong. They could output the data to a program such as Excel then use a formula to modify the date for their record keeping. Some manufacturers of newer GPS receivers have issued statements that their GPS/GNSS receivers will not have an issue with respect to the 2019 GPS week rollover. Others are working on firmware to update their older model receivers. You can check with the manufacturer of your GPS/GNSS receivers to see if there will be a firmware update. If you collect GPS data after April 6, you will see for yourself whether your GPS receiver has this issue. MS-Surface runs Windows 10 S, which is different from Windows 10. PC-MAPPER 9 will run in Windows 7, Windows 8 and Windows 10, but not in Windows 10 S.
A FieldCE GIS 9 users ran into the “insufficient system permission” issue on their Flint PDA. A soft reset did not work. Installation worked fine after a hard reset that was not a factory reset. It turned out that this user selected the “Good Times” font in the Auto Label window. Switching to a common font like the “Microsoft Sans Serif” font resolved the issue. The old MC5GPS data collectors have built-in GPS engines that have outlived their preset GPS life. This causes all the collection dates to be marked with a much earlier date, which creates a problem when you attempt to use PC-GPS to differentially correct the job data. There is no GPS firmware update available, but we have a fix for it. Many of our customers have moved on to collecting real-time GPS data by using our iCMTGIS PRO on an iPad or iPhone device in conjunction with a SXBlue Platinum or EOS Arrow Gold high-precision GPS receiver. If you need to use the Map Grid of Australia based on the GDA 94 datum, you can define these as user-defined coordinate system and datum, respectively within your PC-GIS 9, PC-GPS 9, PC-MAPPER 9, PC-MAPPER AI 4, CMT-Forester 10, CMT-SURVEY 9 or COGOCAD 9 software program. 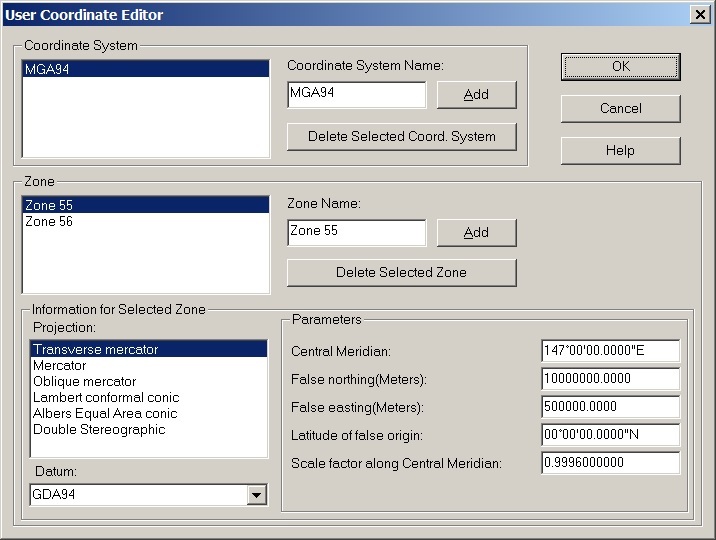 The Edit Datum and Edit Coordinate System buttons are available when you select “User Defined” under Map – Coordinate System. 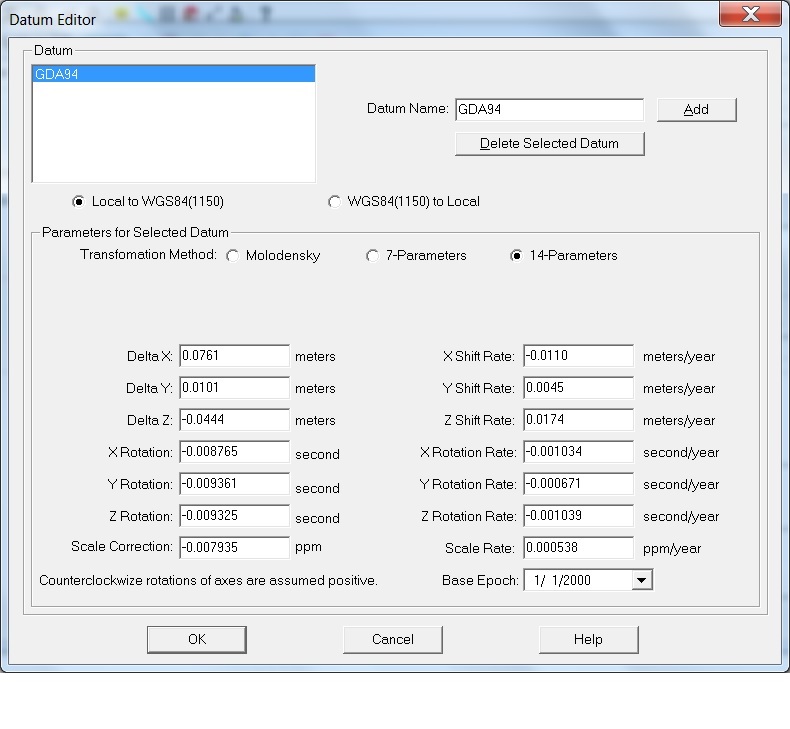 The screen shots below show the parameters to enter for defining the GDA 94 datum and the MGA 94 Zone 55 projection. How to move an existing Feature? Generally we encourage you to record position data faithfully and not manipulate it besides applying GPS differential correction. Should you have a legitimate reason to move a Feature, there are a few ways to accomplish the task. If you plan to run differential correction on the data, then do not change the data before applying the differential correction. Changing the data will cause differential correction to fail. In the Feature Properties screen that comes up when you double-click on a Point, Line or Area Feature, there is a “No Offset” button. After clicking on it, you can enter the offset information to displace the Feature. The “No Offset” button label will change to “With Offset”. a) Move the Feature based on the displacement of one existing point relative to the location of another point. b) Move the Feature by the XYZ adjustment you enter. c) Move the Feature based on the displacement of one existing point to the location of a point for which you enter the exact coordinates. In a) and c) above, you will need to add a Point at the node you wish to use as the Move Point. This function does not work on nodes. If you hold down the Ctrl key on your keyboard then click on a Feature, the Feature becomes “unhitched” from the map. Subsequently you will be able to drag it to any position in Map View. For a Line or Area Feature, you will also be able to drag any node to a new position and change the shape of the Line or Area.